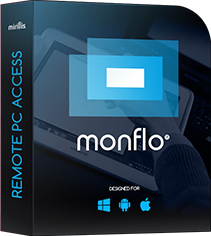 Monflo for PC provides the ultimate performance for Windows PC remote access. It requires to download and install applications on both the PCs you want to use for remote connection - Server and Client. Monflo account is not required to use Monflo for remote PC access, but it is recommended as it allows to easily and quickly connect to your PCs. Monflo Server and Monflo Client apps require network connection. It may be any network connection. Ethernet, 5GHz WiFi or LTE is recommended for the best experience and connection quality. Monflo Server and Monflo Client applications require Windows Vista, Windows 7, Windows 8/8.1 or Windows 10. Now you are ready to enter your username and password to both applications and start to remotely control your PC.